Throughout the world Turquoise has been found in burial sites dating as far back as 7000 years. It is one of the first gemstones to be mined. It has its roots deep in religion, myth and folklore in hundreds of cultures. Some Native American tribes refer to it as the “fallen Sky Stone”, hidden in Mother Earth. Legend has it that the Native American Indians danced and rejoiced when the rains came. Their tears of happiness mixed with the rain and soaked into Mother Earth to become Sky Stone Turquois. Navajo storytellers tell that a piece of turquoise thrown into a river will bring about rainfall and that wearing it would soothe the Wind Spirit. Other tribes believe that the colour blue is male and of the sky and the colour green is female and of the earth. Others believe that adding a piece of turquoise to a weapon will insure it’s accuracy and wearing it would help to overcome illness. Ancient doctors used the stone’s medicinal potential by making it into paste to treat ailments and to purge the body of poisons. Egyptians also mounted Turquoise in Silver to treat cataracts. 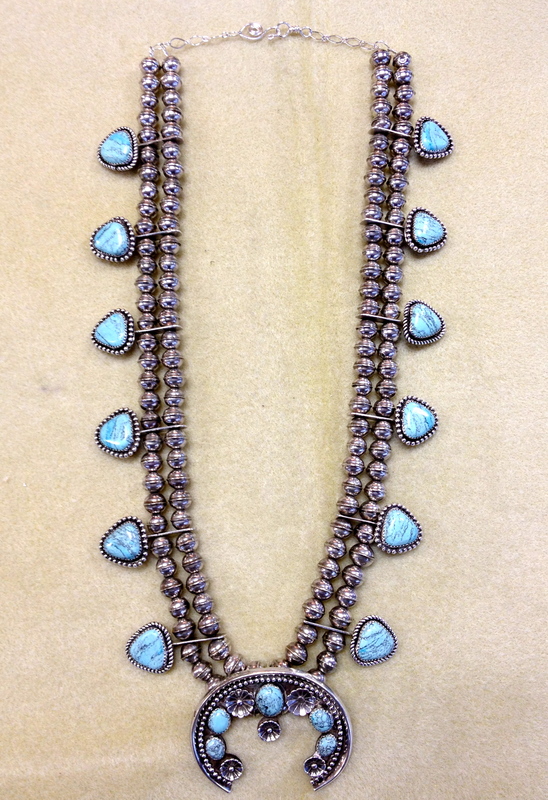 Turquoise jewelry powers are said to include the power to attract love, success, and money. Its also promotes protection, courage, luck, and friendship, It is said to strengthen the body, aid in tissue regeneration, creates peace of mind, emotional balance, and a sense of well-being. Turquoise rates a 5 or 6 on the Mohs Scale. Nearly all Turquoise is cryptocrystalline. This entry was posted in Stones. Bookmark the permalink. LOVE, LOVE, LOVE THE TURQUOISE!